Posted July 18th, 2018 & filed under Insights. You create the biggest impact if you create the largest business. 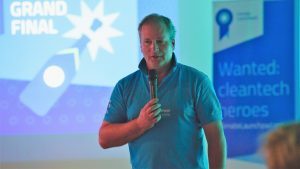 An interview with Hans Westerhof, ClimateLaunchpad Trainer and Project Lead. 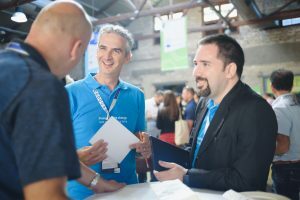 Hans Westerhof has been part of ClimateLaunchpad ever since the early days back in 2014. As Project Lead and as one of our Trainers. We interviewed him on his preferred module in our infamous Boot Camps: Customer Value Proposition. Tell us a bit about your favourite subject to teach our participants. “I like teaching the Customer Value Proposition, because there are a few things that come together in that module. We teach it after the Market Segmentation where you learn about your beachhead market, the customer or group of customers you will target first. As a start-up you don’t have a lot of resources, so you need to focus your efforts. But you also need clients. To offset the risk of doing business with a start-up, you must offer the potential of a huge improvement in the current state of affairs. “I sometimes use the example of a business that produces windows that generate electricity. What is the customer value proposition there? Those windows will generate an x-amount of watts per square meter, which of course is lovely. But when you get to the client’s side and you try to understand their business, it might mean that the true value for that customer is not necessarily the generated electricity. Perhaps the real value lies in the fact that the infrastructure of buildings with these windows becomes much more efficient, much more lean and much cheaper. Another example: Maybe you have a solution for efficient utility installation in city apartments. Your customer might see an opportunity to sell more m2. So the value proposition for a customer can be something different from what you think it is. During Boot Camp we try to get our participants out of their own tunnel and get them to crawl in the skin of their customer. Then the final step is: why is this important? You want to know how much value you create for your customer. That can be hard to figure out, but it helps you to set a fair price for your solution. Why is this your favourite part of the training?